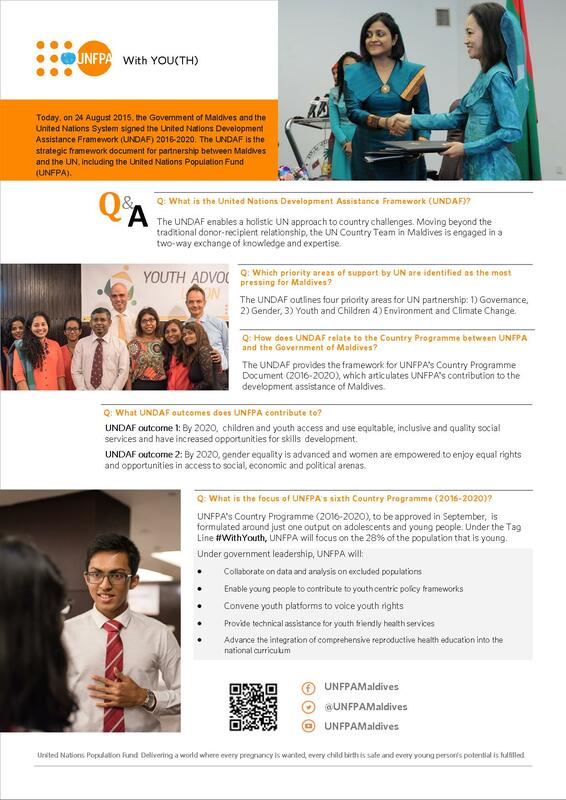 UNFPA Maldives | UNFPA and the new UNDAF - The Government of Maldives and the United Nations System signed the United Nations Development Assistance Framework (UNDAF) 2016-2020 today. Home News UNFPA and the new UNDAF - The Government of Maldives and the United Nations System signed the United Nations Development Assistance Framework (UNDAF) 2016-2020 today. UNFPA and the new UNDAF - The Government of Maldives and the United Nations System signed the United Nations Development Assistance Framework (UNDAF) 2016-2020 today. Within the strategic framework of the UNDAF, Government, Civil Society and UN partners developed a Country Programme Document specifically outlining UNFPA's focus for the next 5 years, formulated around just one output on adolescents and young people. The Country Programme Document (2016-2020) is expected to be endorsed next week. Under the Tag Line #WithYouth, UNFPA's sixth Country Programme (2016-2020) will focus on the 28% of the population that is young.